The New York Times bestselling first book in a dark new series that reimagines the Oz saga, from debut author Danielle Paige. I didn't ask for any of this. I didn't ask to be some kind of hero. But when your whole life gets swept up by a tornado—taking you with it—you have no choice but to go along, you know? Sure, I've read the books. I've seen the movies. I know the song about the rainbow and the happy little blue birds. But I never expected Oz to look like this. To be a place where Good Witches can't be trusted, Wicked Witches may just be the good guys, and winged monkeys can be executed for acts of rebellion. There's still a road of yellow brick—but even that's crumbling. What happened? Dorothy. They say she found a way to come back to Oz. They say she seized power and the power went to her head. And now no one is safe. My name is Amy Gumm—and I'm the other girl from Kansas. I've been recruited by the Revolutionary Order of the Wicked. I've been trained to fight. And I have a mission: Remove the Tin Woodman's heart. Steal the Scarecrow's brain. Take the Lion's courage. 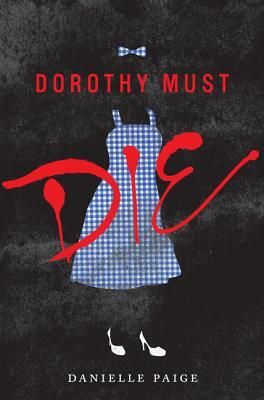 And—Dorothy must die. Danielle Paige is a graduate of Columbia University and the author of the New York Times bestselling Dorothy Must Die series. Before turning to young adult literature, she worked in the television industry, where she received a Writers Guild of America Award and was nominated for several Daytime Emmys. She currently lives in New York City.